Semi-autobiographical exploration of one restless theatre artist's fascination with the play Cyrano de Bergerac by Edmond Rostand. A chance encounter with the text at a suburban public library at the age of 15 leads to a cruel and wonderful calling. Mixing the personal, historical and literary into a journey through Rostand's play and a meditation on the differences between art and life, McEntire puts a unique spin on the usual coming-of-age one-man show. 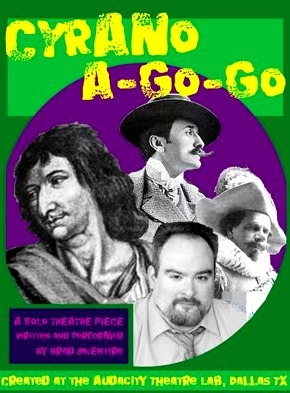 Since the age of fifteen, during the first few weeks of his first ever theatre class, Brad McEntire has been obsessed with the swashbuckling, romantic, tragi-comic play Cyrano de Bergerac by Edmund Rostand. He has grown, over the years into a performer/ playwright, in some ways like the title character of the piece. Publié le 17 / 08 / 2011.